Bunny has slept in our bed with us from the day she was born. In the hospital, My Love shared my hospital bed with me and Bunny slept either on his chest or on mine. When we got home, Bunny continued to sleep on our chests until she was about six weeks old. Around six weeks old, Bunny started sleeping in our bed with us. At around five months old, Bunny was starting to move in her sleep more and My Love and I stopped getting a decent nights sleep. We didn’t want to move Bunny out of our room, but we did want her to have her own space. We decided to try a co sleeper. We borrowed a friends arms reach co sleeper, but were very disappointed in how it worked. The arms reach co sleeper was much lower than our mattress, creating a drop from our mattress to the co sleeper. I did not feel that was safe for Bunny. The arms reach co sleeper also had a metal bar that sat against our mattress and was very uncomfortable for me to sleep next to/on. Bunny was still nursing to sleep and I was not able to nurse her laying down while in the arms reach co sleeper. I ended up buying a mini crib to put next to our bed, but that did not work either. The mattress on the mini crib was not the right height for our bed, and it was the same size as the arms reach co sleeper. I was afraid Bunny would outgrow it before we were done co sleeping. Then I had the brilliant idea to try to side car our crib. Why I didn’t think of this in the first place, I do not know. I blame my lack of sleep! We moved our crib into our room and what did you know, the mattress of the crib on its highest setting was almost EXACTLY the same height as our bed! To side car a crib you simply remove the front rail and attach the crib to your bed. The crib we used next to our bed was a drop side crib so we took off the railing that “dropped.” We put the crib in between our bed and the wall so it was secure and would not move. 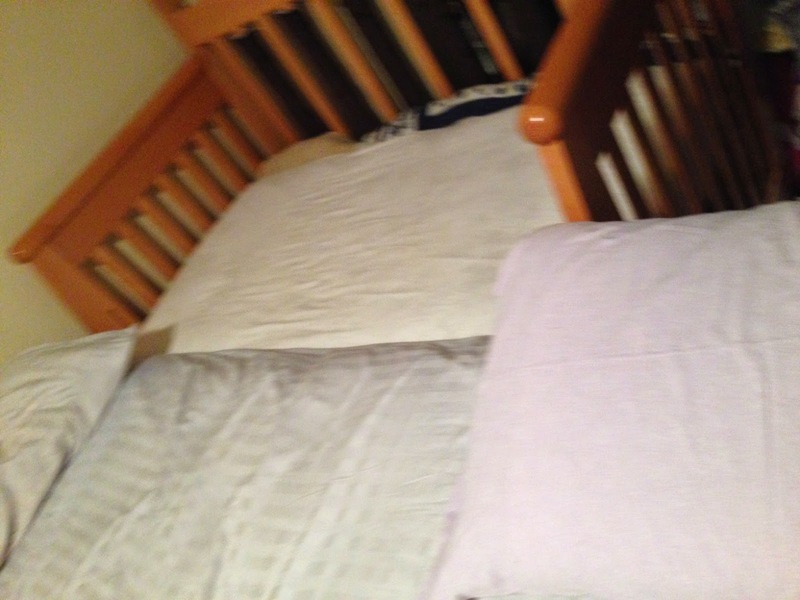 Once we put the crib mattress in the crib, we noticed there was a gap between the crib and the railing. I have heard of people putting foam or pool noodles in that gap, but neither of those seemed like a good idea to me. 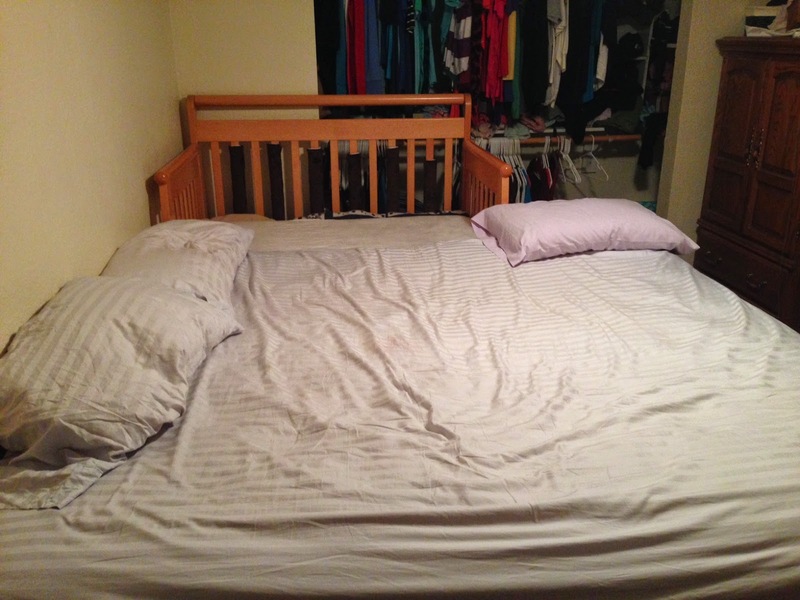 What worked for us was rolling up two blankets and putting them in the gap. That way if Bunny rolled onto the gap, she would still feel a soft item and wouldn’t be able to fall through the gap. Plus she wouldn’t be inhaling weird chemicals or smells. I wasn’t worried about Bunny climbing out of our bed because she was in her crib. I was worried about the extra foot or two our bed has past her crib. I put a firm pillow in that space so I knew Bunny would not be able to fall out of our bed if she did end up crawling out of her crib. Purple pillow at the end of the crib, just in case. Using the crib side car style has been wonderful. Bunny is able to sleep in our room with us, and we can nurse through out the night and I can lay down while nursing her. This allows for me to be able to sleep while nursing Bunny. 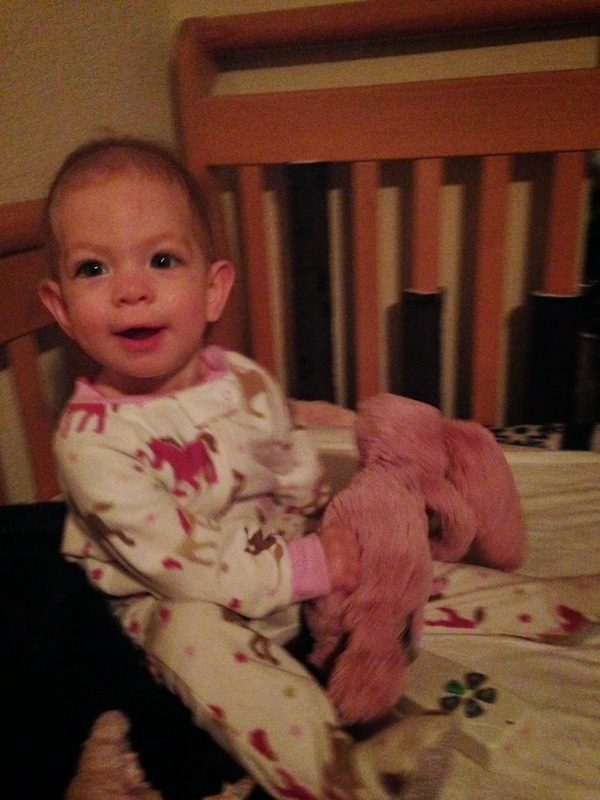 Bunny loves her crib so much, when we start our night time routine, Bunny will crawl across our bed to get to her crib. She knows that is her space and does not want to sleep in our bed anymore! She prefers her own space, but still being near us. It is the perfect solution for us. I love waking up to this face! 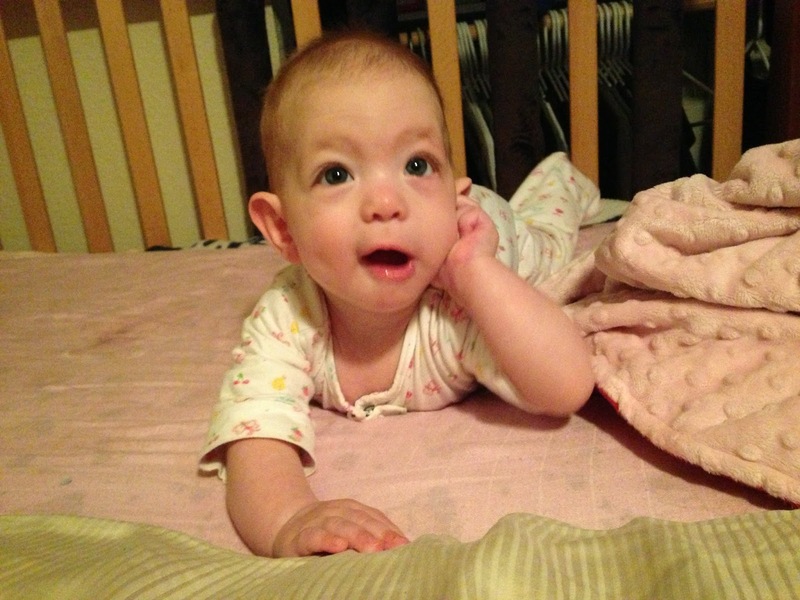 When choosing a crib to side car to your bed you need to consider a few things. 1. Make sure you choose a crib that is stable with one side being removed. 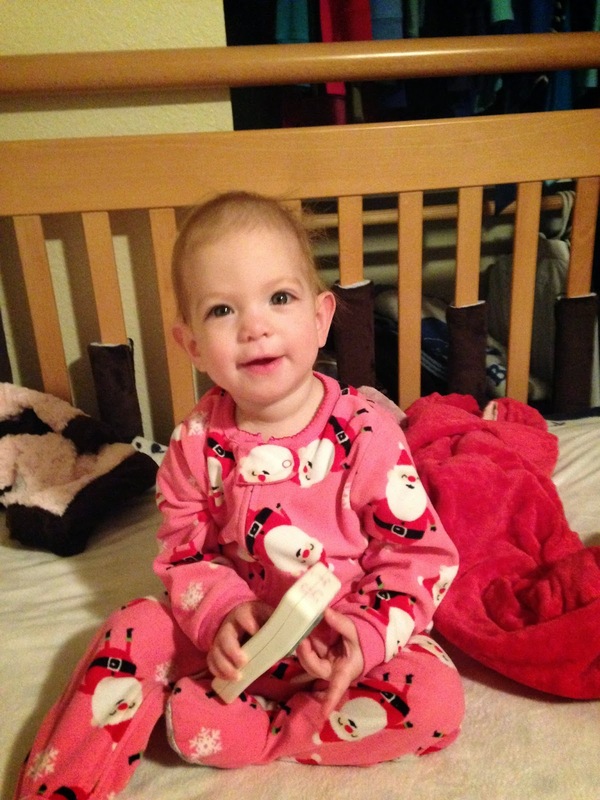 There are many cribs that convert to a toddler bed, these cribs are made to be stable with only three sides. 2. Make sure the crib you choose fits in your space. We had to take our nightstands out of our bedroom to fit our crib in the room with us. Decide where you want your crib to go. Our crib is on my side of the bed so it is an extension of my bed area. I have heard of some people putting their crib at the foot of the bed. Do whatever works for you and your family. 3. Make sure your mattress and the crib mattress are the same height. You can lower or raise your mattress by removing or adding a bed frame, or choosing a bed frame that gets your mattress to the perfect height. You can also raise or lower the crib mattress depending on your crib. This is something to consider when looking for a crib to side car. We measured our mattress height and went crib shopping, only to realize the crib we already had was the perfect height! 4. Make sure the crib is tight and secure against your bed. 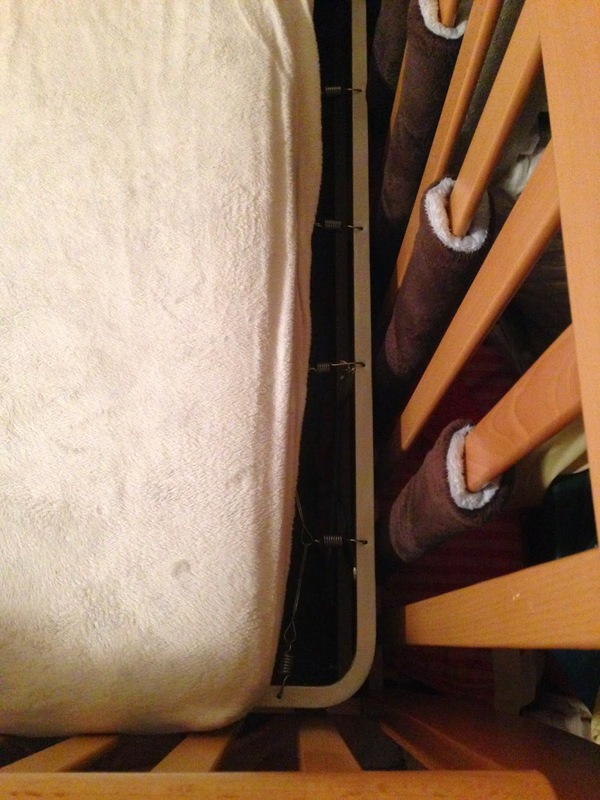 I have heard of people using bungie cords to connect the crib frame to their bed frame. We positioned our crib in between our bed and the wall. The crib was not going anywhere! 5. 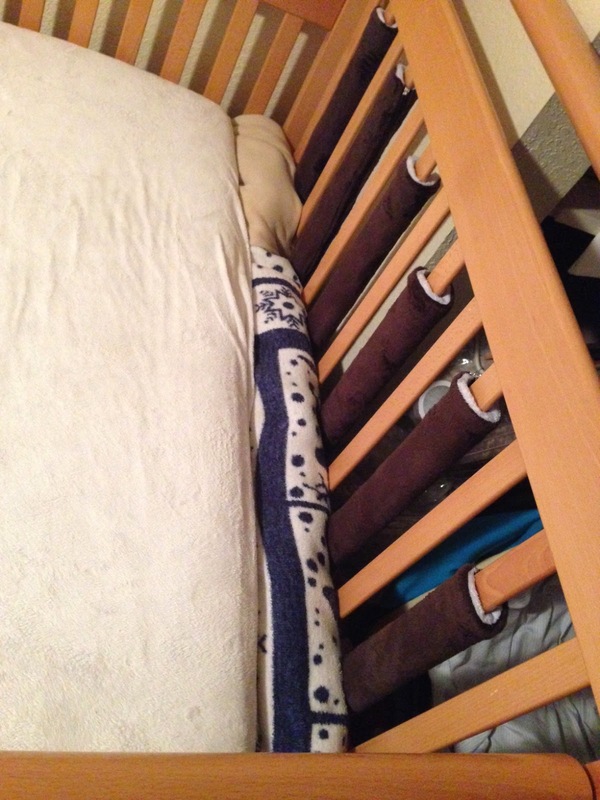 Decide what you want to use to fill the gap between the crib mattress and the crib rails. There WILL be a gap. It might be small, it might be large. I did not want any synthetic materials like a pool noodle or foam. A tightly rolled up blanket was the perfect option for us. Make sure there are not any other gaps. A good rule is to not have a gap larger than two fingers. This ensures your baby will not get stuck anywhere. Do you want to know why we co sleep? Find out why here. Do you co sleep? Do you have a side car crib? Show us your set up!